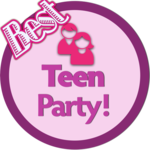 How to throw an awesome teen party! We’ve got some great games here, including scavenger hunts, indoor games and outdoor too. Don’t forget to leave your comments! What's cool, what's not? Here are your best ideas. Great ideas for scavenger events and treasure hunts - keep sending them in! There's always a lot of demand for these games so they're bound to go down well with everyone. Some great games here for your church group, youth ministry etc. You can use these for Halloween, a sleepover or whenever you just want some fun at night.